The new 2016 Family Calendar by Vitadimamma! This is little gift from me to you with my best wishes for a new year full of love and happiness. Last year’s 2015 version had been helping lots of families (including mine!) in scheduling and organising daily, weekly and monthly events and appointments of each family member. And that’s because every one has its own space. 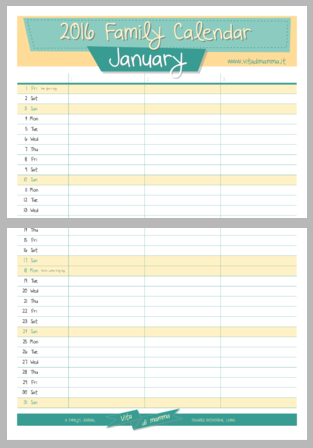 Then, you can decide to print it out in any format you want: A4 works best for limited space, A3 is suitable for a wider paper version or for larger families as mine. And from this year, as Cristiana kindly suggested, you can even choose to print every month in two A4 sheets. Just insert your email address in the box to have it delivered directly in your inbox. Hope this little gift will help you and your family to live a fantastic 2016! 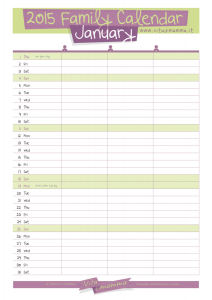 Author LudovicaPosted on 30 December 2015 Categories Blog, HomekeepingTags 2016, Calendar14 Comments on The new 2016 Family Calendar by Vitadimamma! 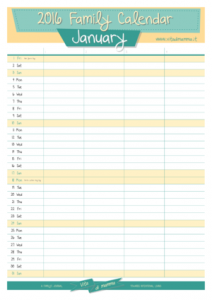 2015 Free Printable Family Calendar by Vita Di Mamma is here! Hi everyone! Christmas is coming and 2015 is just around the corner! What a better way for me to enjoy the festive season than giving all my friend readers a special gift? 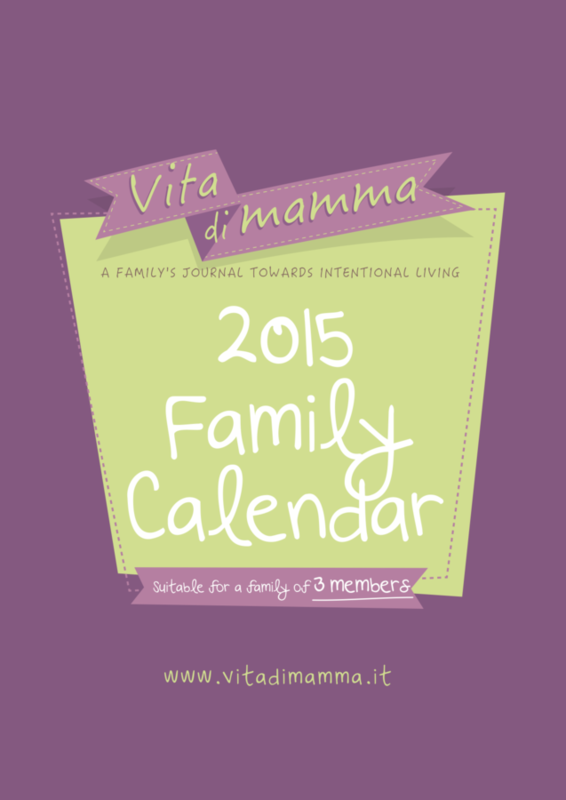 Vita di Mamma 2015 Printable Family Calendar ! You can download it for free just subscribing to Vita di Mamma’ s Newsletter, writing your e-mail address in the form above at the right corner of the page. This calendar is a life saver for our family! 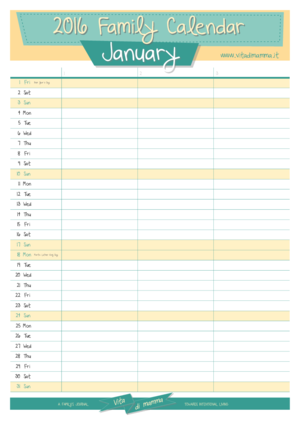 It really doesn’t matter how many apps and softwares we have purchased, downloaded, installed, shared…the old and steady paper calendar seems utterly irreplaceable! And this particular one, even more! Why? 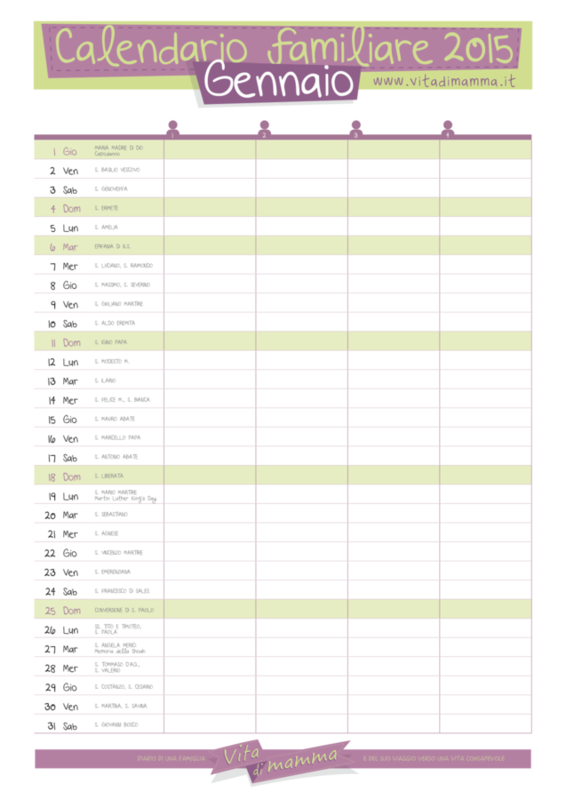 Because it has been projected with families in mind, so every member has its own column to fill, month by month, 365 days a year! Or maybe you can just download the 3 calendars altogether as a Christmas present for your friends! A simple, free, last minute gift, absolutely suitable for every family! Never been so easy: just subscribe to the newsletter filling the form above at the right corner of the page with your email address. And, as an added bonus, from now, on you are sure to never miss a post! I absolutely care for your privacy and it is my duty to never share your email address with any other else. If you are a subscriber yet, don’t worry, instructions to download all the 3 calendars would be automatically delivered to your inbox. HOW TO PRINT IT OUT? Choice is really yours. You can print the calendar out as an A3 format (the bigger version we currently are using) or in a A4 format, the smaller version. Both versions provide you have enough space to be filled by every family member. 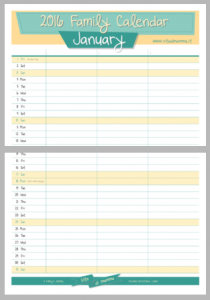 I highly recommend to check if the “Shrink to fit page” option is flagged, so you are sure the calendar fills the entire page. We have also tied a pen at a cord to the hanger, so everyone can easily write on the pages with no fuzz. But options are countless and the sky is the limit: you can choose to bind it, staple it, secure it with paper pins… again, choice is really yours! And it would be so great if you would like to share your customized version of the calendar on Vita di Mamma’ s Facebook page! I hope this calendar might be useful and appreciated to your family! I wish all moms, dads and children who follow Vita di Mamma a very best for the New Year is coming! I am so happy to spend next year with such a great companion! You can follow me on Facebook, Twitter, Pinterest and Instagram, as well! So much fun is happening there! Author LudovicaPosted on 22 December 2014 Categories Blog, Feasts & Traditions, HomekeepingTags Calendar, Christmas, Family, Free 2015 printable family calendar by Vita di Mamma, Home2 Comments on 2015 Free Printable Family Calendar by Vita Di Mamma is here! I will never cease to be amazed by the ability of the Bible to speak to, in millions of different levels, in hundreds of different languages and being able to answer the same questions that men have been asking themselves from the dawn of time. Over the years, our children have had access to some versions of the Bible, written exclusively for children. I often read them aloud to my kids and, depending on their age, I tried to introduce them to the knowledge of this book, “The Book of Books,” as I call it with them, the lens to watch world through. In my childhood, spent in a Christian school managed by nuns, I was strongly influenced by a dark and completely incoherent religious atmosphere . This has highly determined the impact of my future relationship with spirituality. I do not want this to happen to my children. What I wish for them is the living value of joyful and absolutely positive attitude that lays in Christian precepts. Unlike what many people think, and unlike many people have forced to think about, the Bible contains many references to Joy . Reading the stories of the Gospel, everyone can’t avoid to notice how much Jesus was a man of great charisma and character, and certainly joyful man. I do not think many people would had followed him and he would not certainly had been invited to so many parties (remember, as instance, the wedding of Cana ?) if He had been one of those curmudgeons who do nothing but remembering people how earthly life is boredom and full of suffering … (has anyone ever invited Leopardi to any party?). I don’t think so. I always thought that Jesus was a man of great humor , a sense of humor, of course, strictly related to His times, but perfectly in line with that Jewish culture he belonged to. With its simple and straight behaviors, He showed others as the living testimony of hope that we all need to put in life : the hope of consolation, not only the hope of a life after death, but in life on earth, in our daily experience of relationships with others, of the ups and downs, of “good days” and “bad days”. The actual history of Christmas, is not simply the story of the birth of a baby in a manger, but the story of the birth of hope for mankind. On that cold, cold, dark, first Christmas long ago, God has given to men without hope and comfort, the gift of eternal faith in the form of a small child, which would change the world. And this miracle, this gift of hope and joy, takes place every year from that time until today. Sure, God has not given us the assurance that everything would have been smoothly for us and we would have been having only positive experiences (and the Bible and the Gospel are actually filled with notable examples in this regard!). But it is precisely in those experiences of suffering and in the middle of all our troubles, that God is present and comforts us. Living with joy is in fact a choice that belongs to us, not to God the hope of being heard and understood, however, is our greatest security. In this context this year we decided to celebrate ” the birthday of Jesus ” with a special project, the e-book Truth in the Tinsel. An Advent Experience for Little Hands by Amanda White . This is an e-book in which children can make their own history of Christmas and the birth of Jesus, by listening to the stories of Christmas and through creative projects, in the course of 24 days. For every day, from December 1st to 24th, there are instructions to create ornaments, decorations and creative jobs, in line with the story of the day, and through some thoughts, you are allowed to meditate twith your children effectively on the main aspects of the history . The book is written in plain English, but ,for those who do not know English well, I assure you that is not a big problem: in fact, the extracts can be easily found on your own Bible and the Gospel in your own language. And the instructions are absolutely simple to understand even for those who do not chew English well. If you run into any problems or difficulties, I will be happy to help you, through my email . 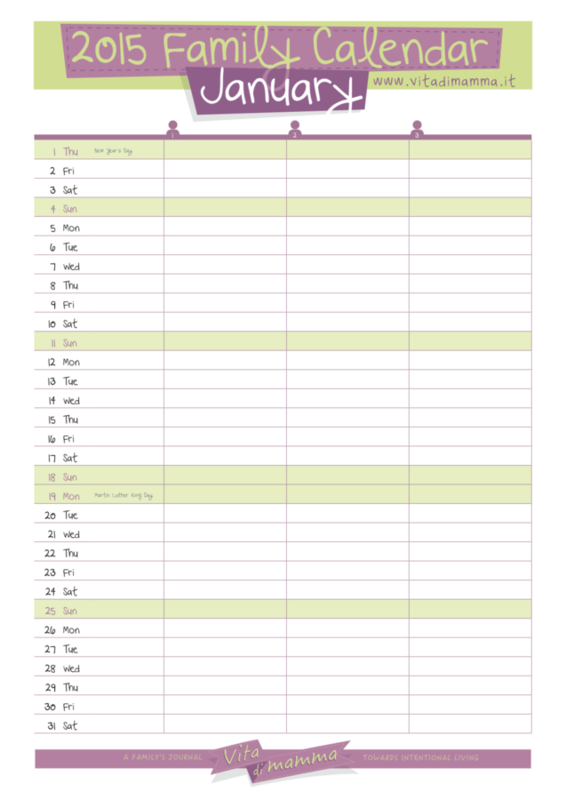 In the book is also included a list of what tools are needed during the month (and they are mostly everyday objects and recycled materials) and also a detailed list divided by day and by project. The beauty of these creative works is that they can be customized as you wish, depending on what you have available. And you are not forced to do them all! You know, Christmas season is busy, and in fact we do not believe we will manage all 24 projects, but we will try to be consistent in reading the passages, in order to fully immerse ourselves in this Christmas atmosphere. However, we will be engaged, no more than a quarter of an hour a day, maybe at bedtime. If you click” Like” on the you will see the photos updated versions of our projects, so if you want, share your photos and comments of projects or the ideas that maybe your kids have expressed during the day. Are you ready to celebrate Christmas with your children in this special way? We look forward to begin!